The 31 January marks the 60th anniversary of the East coast floods - described as the worst national peacetime disaster to hit the UK. Exceptional weather conditions, coupled with an inability to warn people, meant that whole communities were unaware of the imminent threat from the devastating storm surge that saw many low lying areas of East Anglia and the Thames Estuary suffer severe flooding. On the night of Saturday 31 January 1953 and morning of 1 February 1953 the North Sea was experiencing spring tides. 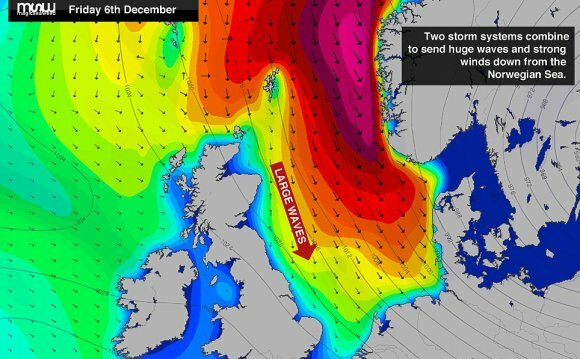 A deep Atlantic depression passed to the north of Scotland and moved southeast down the North Sea. The northerly gales on the western side of this depression forced sea water south at the time of high tide, causing a tidal surge down the North Sea which locally exceeded 5.6 metres (18.4 ft) above mean sea level. The winds also generated very large waves in the North Sea that damaged coastal defences. A maximum gust of 126 mph was observed at Costa Hill, Orkney as the storm centre pressure fell to 964 hPa over the northern North Sea. The combination of high spring tides, storm surge, winds and very large waves resulted in sea defences being overwhelmed in some locations, leading to extensive flooding. In England, 307 people were killed in the counties of Lincolnshire, Norfolk, Suffolk and Essex. Nineteen were killed in Scotland, whilst 1800 people lost their lives in the Netherlands. 32, 000 people were evacuated. 160, 000 acres of land was inundated with sea water and not usable for several years. Estimated damage ran to £50 million at 1953 prices, approximately £1.2 billion at today's prices. Infrastructure including power stations, gasworks, roads, railways, sewage services and water services was put out of action. A storm surge is possibly one of the most dramatic weather events for the east coast. These are caused when deep depressions track east from the Atlantic, passing close to the north of Scotland. As the depressions move across the ocean the lower pressure causes the sea level to rise - for each 1 hPa drop in pressure sea levels rise by up to 1 cm - and the winds push the surface waters of the sea forward, a motion known as 'wind drift'. On reaching the relatively shallow North Sea this water is forced southwards, eventually causing a pile up of water in the south. This is because the water cannot escape through the narrow Dover Strait and the English Channel and so gets trapped in the southern North Sea. The effect is enhanced by the strong northerly winds experienced on the rear flank of the depression as it continues eastwards. As a result of the east coast floods an official service for forecasting coastal flooding - the Storm Tides Warning Service - was established within the Met Office. This is now provided through the joint Environment Agency and Met Office partnership in the Flood Forecasting Centre, which benefits from continuously improved forecasting accuracy through the pull-through of science and technology in observations and the modelling of our weather in the Met Office. Sixty years on, the Met Office can forecast the development and movement of this type of Atlantic storm accurately up to five days ahead. Our high resolution atmospheric forecast models coupled to ocean models provide valuable early warning of potential storm surges up to five days ahead and detailed, accurate guidance on the height of the surge and wave overtopping up to two days ahead.